Oscar Medley Real Estate is owned and operated by Oscar Medley. and his wife of 51 years, Barbara Grubb Medley. Oscar and Barbara were both born and raised in Jeff Davis County and have lived here all of their lives except for five years Oscar spent in the Navy which included two tours in Viet Nam. 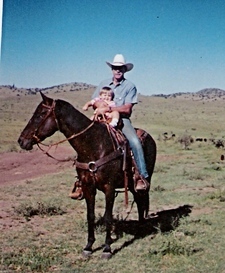 Their Great Grandparents on both sides came to the Davis Mountains in the 1890's and began ranching. Oscar and Barbara have been involved in ranching all of their lives and still operate a portion of the "Medley Ranch" that the Medleys bought from the Grubbs in 1905. Oscar and Barbara as well as their two childeren Bart and Janay and their grand daughter Ashleigh graduated from Fort Davis high School. Ashleigh is presently a Freshman at Texas Tech. Oscar taught and coached in the Fort Davis School system for 26 years and spent the last 5 years of a 26 year career as High School Principal. Oscar was involved in the Real Estate business before he began his teaching career. He enjoyed it so much, upon retirement from the school business in 2000 he decided he would like to get involved in Real Estate once again. Barbara retired from the school business after 34 years and is now the office manager of their real estate business. What Oscar really enjoys about the business is meeting so many nice people and the fact that you are showing customers things that they want to see. Our motto is "We will meet you at the back of the pasture and be riding a good horse when we get there. That means we came to help.That is what we are about. If we can help you, your family, or your business with your Real Estate needs please call us. We would love to help you find or sell a home, a ranch, or a commercial operation. We are West Texans, West Texas is our home, West Texans are our people, let us help you and your family become a part of West Texas.